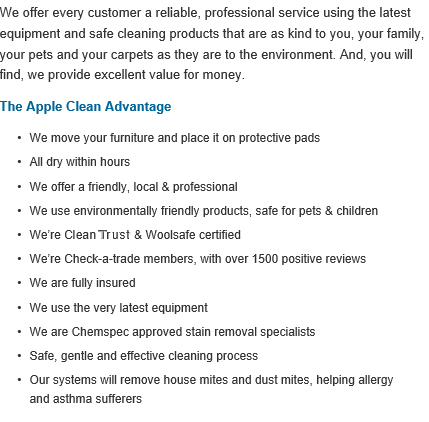 Apple Clean are the Woking carpet, curtain and upholstery cleaning experts. Local for over 25 years, we provide high-quality carpet, curtain and upholstery cleaning services in Woking and across Surrey. For professional domestic and commercial stain removal or carpet, upholstery or in-situ curtain cleaning in Woking, get in touch with Apple Clean for an unbeatable personal service. Hi, I’m Jonathan and for over 25 years I’ve been supplying carpet, curtain and many other cleaning services to homes and businesses in and around Woking. My beliefs have always been that the best way to success with a local business is to offer an exceptional service which is both professional and personal, giving great customer service and achieving excellent results. Give me a call today and I’ll explain what we can do for you and I’ll give you honest and realistic advice. At the same time you can get an instant no-obligation quote. 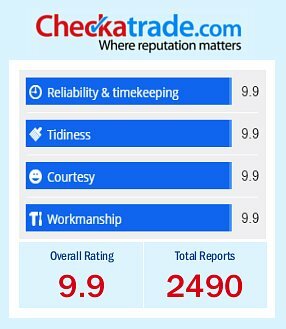 We are very proud members of the Check-a-trade scheme as it enables you to see certified and genuine reviews from past customers in and around Woking. Give us a call us now on 0800 587 4571 to find out more about the cleaning services we provide to homes across Woking and how we can help you. If you’re looking for fabric cleaners in Woking and its surrounding area in Surrey, look no further than Apple Clean. Our specialist cleaning experts have delighted many customers in Woking, and have carried out services such as rug cleaning, stain removal and in-situ curtain cleaning to the highest possible standard. Apple Clean’s cleaning specialists will be happy to get your furniture looking as good as new, and no job is too big or too small. We are proud to offer the best cleaning experts in the industry and we specialise in the cleaning of difficult-to-clean fabrics such as leather and silk. 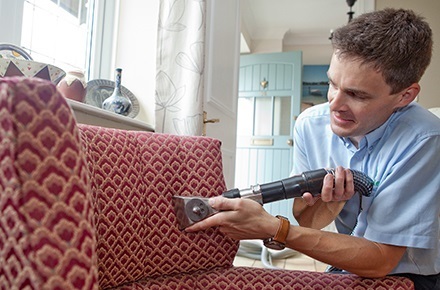 We promise to get your furniture looking as good as new with minimal hassle to you and our friendly specialists will be able to protect your furniture against future stains to keep it looking its best. Apple Clean offer our expert domestic and commercial cleaning services to clients across Surrey including Woking, but we also provide our services to properties in Camberley. 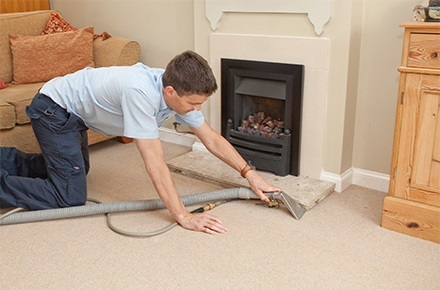 We operate throughout Surrey and have an outstanding reputation with all our clients past and present, so you can rest assured that we will deliver professional results through our carpet cleaning, stain removal, upholstery cleaning and in-situ curtain cleaning in Camberley. We are also delighted to offer our specialist domestic and commercial cleaning services to clients based in nearby Bracknell, where we already have a multitude of satisfied clients who are delighted with the cleaning services we have had to offer over the last 25 years. For professional carpet cleaning in Bracknell, as well as the very latest cleaning technology and materials to guarantee high-quality carpet, curtain and upholstery cleaning services, make sure you get in touch with Apple Clean today. Whether it’s a domestic or office environment you want to keep clean, we have the right equipment for the job. Our gentle techniques are perfect for any surface you don’t want to tackle yourself, and because we don’t need to remove anything from your home, you can go back to using them on the same day. If you’d like to find out how we can assist you with your cleaning needs in Woking, get in touch today to get a quote from Jonathan.